PROCEEDINGS OF THE COMMISSIONER AND DIRECTOR OF SCHOOL EDUCATION TELANGANA :: HYDERABAD- 4. SUB:- SE DEPARTMENT - MID DAY MEAL SCHEME - Implementation of Mid Day Meal Scheme - SMS based Monitoring System - Certain instructions issued - Reg. All the District Educational Officers and Mandal Educational Officers in the State are hereby informed that the Government of India is reviewing the Automated Reporting and Monitoring System by way of SMS on Implementation of Mid Day Meal Scheme on daily basis. Further, they are informed that daily number of students present to the school is also included in the SMS format. Therefore, they are requested to inform all the Head Masters to send daily SMS to 15544 regarding meal taken and number of students present in the format. Further they are requested to see that the SMS should be sent by all the HMs of the schools on daily basis and enrolment monthly once. PROCEEDINGS OF THE COMMISSIONER AND DIRECTOR OF SCHOOL EDUCATION TELANGANA :: HYDERABAD - 4. Meal Scheme - SMS based Monitoring System - Certain instructions issued- Reg. All the District Educational Officers and Mandal Educational Officers in the State are hereby informed that the Government of India is reviewing the Automated Reporting and Monitoring System by way of SMS on Implementation of Mid Day Meal Scheme on daily basis. Further, they are informing that daily 500 to 600 schools are submitting the reports that the Mid Day Meals is not being served for certain reasons. It might have been happened due to sending of SMS with wrong format. They are further requested to inform all the Head Masters to send daily SMS to 15544 regarding meal taken in the format. Therefore while enclosing the SMS formats they are requested to issue necessary instructions to all the Head Masters to send the SMS daily in a proper manner without giving any scope for wrong messages. The details of messages sent on 08-08-2017 is herewith enclosed for reference. Further they are requested to see that the SMS should be sent by all the HMs of the schools on daily basis and enrolment monthly once. TELANGANA :: HYDERABAD - 4. SUB: SE DEPARTMENT-MID DAY MEAL SCHEME - Implementation of Mid Day Meal Scheme - Certain instructions on ONLINE data entry- Reg. All the District Educational Officers I Manda! Educational Officers in the State are hereby informed that the Government of India is frequently reviewing on the data entry in MDM-MIS portal and ARMS (Automated Reporting and Management system) i.e. SMS based monitoring system. (I) To ensure that the SMS should be sent by all the Head Masters daily. (2) To enter Annual data and Monthly data up to June, 2017 in trgmdm.nic.in portal. (3) To enter the AADHAR status data in trgmdm.nic.in portal. (4) To enter the monthly data from June, 2017 in CDSE portal. Further they are hereby informed that the data entry pertaining to meals taken made in MIS portal and COSE portal and also sent by SMS should be tallied. If any deviation in this regard necessary action will be initiated against the concerned official. Sub : School Education - Monitoring of Mid Day Meals Scheme through technological intervention such as SMS.-Certain Instructions issued - Reg. All the District Educational Officers in the State are here by informed that the Government has decided to implement the Automated Reporting System in implementation of Mid Day Meals Scheme in the State. In this regard, the mobile numbers of all the Head Masters have been obtained from the District Educational Officers and the same have been uploaded & validated in the concerned website. While enclosing the list of Schools and Mobile numbers activated all the District Educational Officers are directed to take the following necessary action to start the SMS Based Automated Reporting System with effect from 30.01.2017. Step 2:MDM <Space> No, of Students ➤ for No. of Students Taken Mid Day Meal. MDMS: Mid Day Meal Scheme was launched by the Government of India which helps poor pupils from rural and urban areas and resolves issues of lack of nutrition, food security and access to education.Mid-Day Meal mobile app is meant for effective monitoring of daily and monthly mid-day meal data to be sent by the schools. The app once installed on android device, need Internet to send MDM figures as MDM in charge has option to send the daily attendance against meals consumed pupil count figures through the app. This simplifies the job of MDM in-charge, who just has to enter his login credentials in app to feed the data. The higher authorities at Block, District and State level have a very simple web portal for effective and efficient monitoring of daily as well as monthly data transmission by all the schools falling under their jurisdiction. The authorities would analyse the attendance data for calculating foodgrain allocation to schools.This system introduces transparency in food delivery and utilization mechanism by completely eliminating ghost students/teachers. 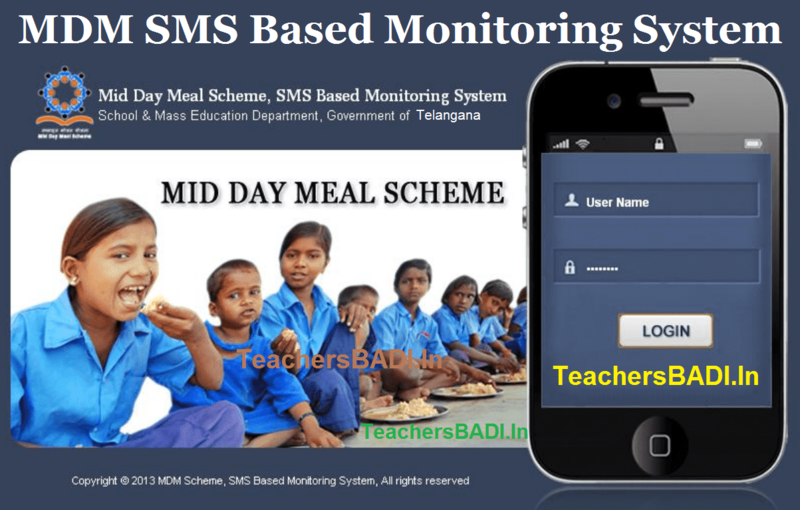 MDM Monitoring through SMS: Mid-Day Meal taken report by SMM is meant for effective monitoring of daily and monthly mid-day meal data through SMS to be sent by the schools. The MDM Monitoring through SMSprovides additional data communicating mechanism for the MDM in-charge/teacher who has to send the daily/monthly data using SMS. MDM Monitoring through SMS, once activated on mobile device, does not need Internet to send MDM figures as user has option to send the figure through SMS from the Mobile. MDM By Telangana: Provision of Egg/Banana, The State Government is providing Rs.1.00 per day per child to provide weekly 3 eggs / banana to all children. Telangana State is providing super fine quality rice. The T State Government is providing MDM to IX and X class students also from State’s own resources. Creation of monitoring cell for regular review of scheme. Data has been entered into MIS portal regularly and 100% completed. The same is completed for 88% schools. Services of SSA data entry operators at District/Block level are being utilized for updating the data in the MDM MIS web portal.